took a turn to the City to once again help raise funds for the Red Cross. Much better weather than the last time we sung, check out the difference in our apparel. 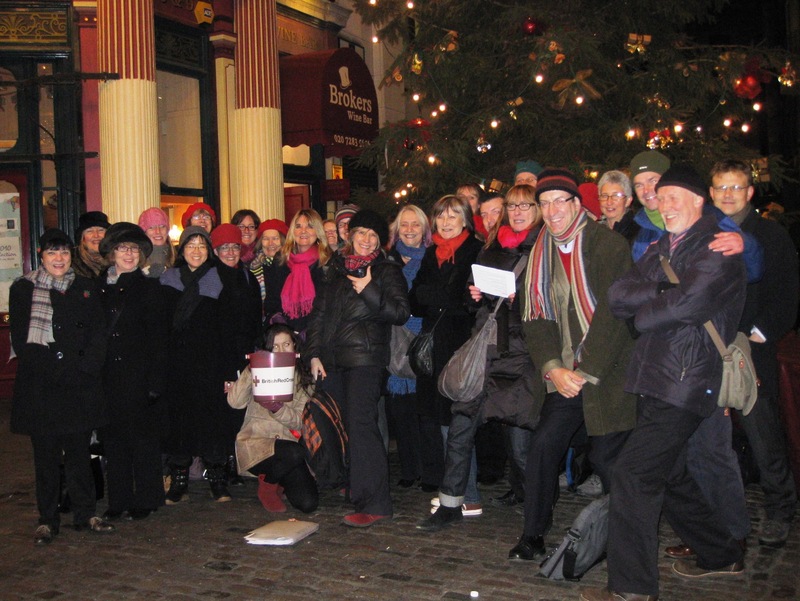 In December we sang for the Red Cross in Leadenhall Market in the City of London and it was fureezing -much to the dismay of the City workers trying to enjoy a quiet pint and a fag outside a couple of hostelries. We raised a few squids for the Red Cross who need all the help they can get, and every little gesture helps. This time we sang near Spitalfields Market. Sadly most people just run by, much too busy to listen or to donate, thank goodness Angela’s family and a couple of partners were there applauding our efforts. I suppose we should be grateful no-one threw anything at us. It was great fun and gave us a chance to see how much of last term’s repertoire we had remembered…sounded pretty good to me. New term starts tonight…yippppeeee! Categories: Acapella Song Books, LONDON, singing, Thumbs Up!